Originally from Cambridge, Kelly qualified from Cardiff Dental School in 2015 with a First Class Hons Degree. Here, she met her husband and settled in South Wales where she has worked in General Practice ever since. Kelly was delighted to join the team at Bethcar Dental Practice in November 2017. Kelly loves providing all aspects of family dentistry, but has a special interest in rebuilding confidence in those with dental anxiety, restorative care and oral surgery. 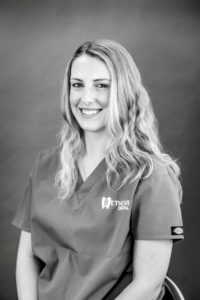 Kelly understands how daunting coming to the dentist can be, and aims to ensure that all of her patients feel comfortable and confident in a dental setting, especially from an early age. She is always happy to discuss and offer advice on how you and your family can look after your teeth! Since joining the practice, Kelly has gone on to successfully complete her MFDS Examinations and has become a Member of the Faculty of Dental Surgeons through the Royal College of Surgeons in Edinburgh. Kelly is also a registered provider of Invisalign Go, the world’s leading brand in clear aligners (braces). Kelly is always happy to discuss your concerns, and is able to use ClinCheck technology to show you how Invisalign can help you achieve a straighter smile in as little as 3 months. In addition to general dentistry, Kelly also has a keen interest in facial aesthetics and completed her training at the Bob Khanna Training Institute in Reading. Kelly is qualified to carry out advanced anti-wrinkle injections, including hyperhidrosis (excessive sweating) and dermal fillers. Kelly believes that patient safety is paramount when considering facial aesthetics and she is passionate about ensuring that any patient wishing to undergo injectable aesthetic treatment do so under the care of a registered, and qualified professional, such as Kelly or Laura.